Good afternoon,this note card is quite in keeping to the island where I live, we have many different shells and starfish on our beaches. So this was a fun card for me to create. Let me know what you think of it. Thanks for visiting and be sure to come back again. What a beautiful card! Thanks for sharing. Judie I love this card. I would love to get a note from you on it. Very nice card Judie. 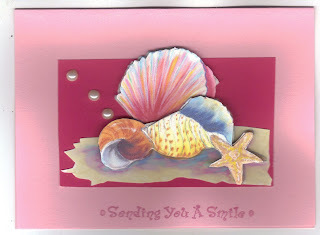 Love the soft pink you used and the sentiment is perfect.